Winning money from betting on football is not easy. It can be done, but it takes a great deal of skill. It also requires a significant time commitment, and a fundamental understanding of the strategy that's involved. A lot of people who bet on football, or are interested in doing so, don't realize this. This is one of the reasons why so many people who bet on football lose money. They think that their knowledge of the game and the teams that compete is enough to take on the bookmakers. It really isn't. Being an expert on football certainly helps, but it's relatively useless without knowing how to use that expertise effectively. Of course, there are plenty of people who bet on football primarily for a bit of fun. They like to win, of course, but that's not their sole motivation. They just enjoy the added excitement of watching a game with some money riding on it. That's fine. There's nothing wrong with being a recreational bettor and not everyone wants to put in the effort that's required to make money from betting on football. If you are someone who wants to take their betting more seriously, and your goal is to make consistent profits, then you're going to HAVE to put in the effort. You're also going to need to learn about football betting strategy, and that's where this section of our football guide can help. This page starts with some basic strategy advice that you should start following immediately, and goes on to discuss using different types of wagers. It also covers the subject of handicapping, and there are several advanced articles covering specific strategies. Much of the advice in this strategy is useful for beginners as well as experienced bettors, but it does assume that you at least know the basics of how to bet on football. There is plenty of relatively easy stuff you can do to improve your chances of winning money from betting on football. You're going to want to get on to the more advanced topics if you're truly committed to making substantial and consistent profits in the long run, but you don't necessarily need to worry about that until you've mastered the basics. Just following the simple tips below will straight away give you a better shot at making money. We've put this piece of advice first because it is exceptionally important. It's fair to say that you will never be a successful bettor if you can't learn how to manage a bankroll properly. Poor money management will almost always lead to going broke, no matter how good the rest of your skills are. Good bankroll management is not difficult. It's just a simple matter of setting some rules for how much you're going to stake on your wagers. The slightly more challenging aspect is then sticking to those rules, but if you've got enough discipline then that shouldn't be too hard. Bankroll management for football betting is essentially the same as bankroll management for betting on any other sport. Our general sports betting guide includes an article on how to manage a bankroll effectively, and we highly recommend reading it. It's questionable whether this can actually be considered strategy advice, but it's certainly good advice. Using the internet to bet is far and away the easiest way to bet on football, and it comes with several advantages. Not least is the fact that there are several bonuses and rewards that you can take advantage of and boost your bankroll from. The odds and lines are usually very competitive too, and there tends to be an excellent selection of betting markets available. You shouldn't just use the first betting site you find though. You need to use one, or more, of the top sites in order to get maximum benefit out of betting online. One of the biggest mistakes that people make when betting on sports of any kind is placing too many wagers. Successful betting is not about the quantity of wagers that you place, it's about the quality of those wagers. It's much better to place a small number of well thought out wagers than it is to place wagers on every single game each week. It's also fine to completely pass on a particular game week if you don't see any good opportunities. Betting for the sake of it rarely works out well. Imagine you were looking to put some of your savings with a local bank, and you had two banks to choose from. One is offering you 6% interest, and the other is offering you 8%. Assuming everything else is equal, you'd take the 8% right? Of course you would, because you want to get the best possible return on this money. The same principle applies when betting on football (or betting on anything in fact). You're not looking for the best interest rate though, you're looking for the best odds and lines. Time spent on finding them can make a significant difference to your overall results. We suggest having accounts at a few of the leading football betting sites, and comparing the odds and lines for every wager you place. There's another article in this guide where we've put together a list of common mistakes made by football bettors. One of those mistakes is not watching enough games. So many people believe that the best way to be successful is by focusing entirely on analyzing stats and relying on that analysis to make good decisions. Stats help for sure, a lot, but they are no substitute for actually watching games and forming your own opinions into the relative strengths and weakness of the teams and players you bet on. There's more than enough football on TV, and there's really no excuse for not watching some of it. You don't have to watch every live game of course, but you should certainly try to watch as many as you can. Even just watching the highlight reels can be helpful. Math plays a big role in gambling of any kind. If you want to be a successful football bettor, then you really need to be aware of all the math involved. More specifically, you need to know about probability and expected value. Without that knowledge all you'll be doing is betting on what you think might happen. You might think that's all you need to do, but successful betting is more complicated than that. Before placing any wager, you should ideally determine how likely you think it is to win. This is where probability comes in. You should then compare how likely it is to win to the odds you are being offered. This is where expected value comes in. The basic principles of probability and expected value are not really too complicated, even if you're not especially mathematically minded. You really do need to understand them though. If you don't, please take the time to read the following article in our general sports betting guide. Analyzing your betting performance is essential if you want to maximize your potential for profit. No matter how good you become, there will ALWAYS be ways to improve your skills. Even the best and most experienced bettors still make mistakes, even if they are just minor ones, and the most successful strategies can usually be adjusted to be even better. The only way you can properly analyze where you might be going wrong and how you can improve is if you keep accurate records on all the wagers you place. Surprisingly few bettors bother with this, and yet it doesn't even have to be particularly time consuming. Once you've set up a spreadsheet it's just a case of entering the relevant details every time you place a wager. You can then periodically review your bets, and your results, which will help you in the end. The best football bettors know that long term success requires lots of effort and hard work. There's plenty to do during the season, but the off-season is not the time to just sit back and relax. Preparing and studying for the upcoming season during this period can be invaluable, and it's something you should definitely be doing. There are all several ways you can give yourself a better edge by utilizing the off-season effectively, and we cover the best of them in the following article. An important piece of advice that we didn't mention above is that you should consider using a variety of wager types for your football betting. There's money to be made even if you just stick to betting on the spread, but you'll be missing out on other opportunities if you limit yourself like that. First of all, you should make sure that you know all about the different types of wagers and how they are used in football betting. Once you understand that then you can start thinking about how best to use them. In the following pages we explain all about the different types of wagers you can place on football, and also offer some basic strategy advice for each one. 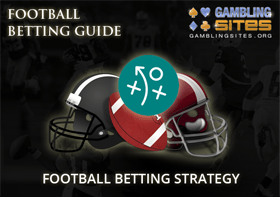 The strategy advice that you'll find in these articles is not necessarily the kind of strategy that's going to help you to become an amazing success when betting on football, but it will certainly help you to maximize the possible value you can get from each specific wager types. Handicapping is a topic that often confuses people when they first start betting on football, or any sport for that matter. This is usually because they don't really understand what handicapping is all about. It's actually not as complicated as you might think. There are some advanced aspects to it for sure, but a lot of what you need to know is relatively straightforward. We recommend starting out by learning the basics of general handicapping. If you have any aspirations of being a successful bettor then you really need to understand the basic concept of general sports handicapping. It's really a quite straightforward concept, and even the more advanced aspects are not that difficult to understand if they're explained to you properly. Proper explanations are exactly what we provide in the following article. We cover all the basics of handicapping the market that will help introduce you to what's involved, and we touch on the most important techniques you need to learn as well. Once you're familiar with the above, you can start to focus on how to handicap football specifically. There are certain aspects of handicapping football that are unique to this specific sport. You'll need to be familiar with these if you plan to make money from your football. The following article will help you to become a competent football handicapper. You�ll also need to familiarize yourself with the various factors that should be considered when handicapping football games. The following article can help with this. We provide details of all the factors you should be analyzing, and explain why they're important. In the following articles, we provide details of how to effectively implement specific football betting strategies. Some of the advice in these is more advanced than what we've covered so far, but we make sure to explain everything in a way that is very easy to understand. Buying half-points is considered by many to be just an expensive way to try to win more wagers. It certainly can be, but it can also be an effective strategy if used correctly. This articles explain why, and also offers advice for buying half-points. Live betting and half-time betting should be ignored at your own peril. They provide lots of additional opportunities for finding value wagers. The strategies required differ from pre-game betting though, as we explain in this article. Betting season win totals has become increasingly popular in recent years. Although long term bets such as these have their downsides, they can be profitable and should therefore be considered. This article gives you some useful advice. This is one of the more advanced strategies we cover in our football betting guide, but it can be very helpful. In this article we focus on using the Poisson distribution model for finding value in prop bets, with detailed explanations and advice. In the final part of this page, we're going to discuss market efficiency. This is something you should try to understand if you want to be a successful football bettor. You might not think of betting as a market, but that's exactly what it is. It's a supply and demand issue. Supply comes in the form of the wagers offered by bookmakers, which can be broadly categorized as being positive expected value (+EV) or negative expected value (-EV). If you don't understand these terms, here's some very basic explanations. Any bookmaker selling too many +EV bets would go broke. Whenever one is available, there's huge demand and they sell out fast. Who's buying them? Most often, the largest and most talented bettors in the world are picking off +EV lines. To explain further, the football betting market is effectively controlled by the biggest sportsbooks, bookmakers and betting sites. When they set early lines, they closely monitor the action they're taking. If they get lopsided action (i.e. they take a lot more bets on one particular outcome), then they adjust their lines accordingly. If they continue to get lopsided action, they adjust them again. They basically adjust until they find a spot where they are getting balanced action. Smaller bookmakers and betting sites will generally set their odds and lines close to the larger operators. Sometimes, though, they may make one side of a wager slightly more attractive though. For example, you might see the following point spread available at one bookmaker. Another bookmaker might have the Dolphins at +3.5 and the Bills at -3.5. There's an obvious advantage in taking the +3.5 instead of the +3 when backing the Dolphins and, as many bettors shop around for the best lines, this bookmaker would probably take a lot of action on the Dolphins. At some point, they'd then move the line back to +3. This whole process is essentially what keeps the betting market efficient, as supply and demand always end up balanced. Once you understand this, you should understand the importance of trying to find value. We started this article by stating that winning money from betting on football is not easy, so you might be surprised by the following assertion. We believe that anyone can make a good profit during the football season even if they start without an ounce of handicapping knowledge and no football knowledge at all. They'll need to learn the basics of handicapping the market, and they'll need to understand the importance of bankroll management and that the market is efficient. Some insight into the strategy involved is required too. But that all can be achieved by reading this page and the articles linked from it. There's enough information and advice here to propel anyone well on their way to successful football betting.